Talk about bad luck! Sadly, the EURUSD retracement was unable to trigger my buy limit order, which caused me to miss the 200 pip jump of the pair. Even though I did miss the move by merely 19 pips, I’m not feeling too down. Like one of my readers pointed out in my other post, it’s not about winning each individual game, but about winning the league. When I look at my records, I want to see that I have come out on top, despite missing and losing trades. Let’s see what this brand new week brings Huck! I think I’m gonna go all bearish on the dollar today. European Central Bank President Jean-Claude Trichet is scheduled to give a speech today, and from the looks of the positive note on EU stress tests and the recent better than expected economic reports, I’m betting that Trichet will be slightly upbeat on the region’s growth. Meanwhile, I think that the dollar will have trouble finding fundamental support in the next few days, especially after US Fed Chairman Ben Bernanke‘s “unusually uncertain” statements are still fresh on the traders’ minds. I gotta be careful with this one though as the the non-farm payrolls data will be coming out tomorrow. It is one of the craziest reports out there on the forex streets, which means we could see a lot of volatility on the release. An upside surprise just might support the latest ISM, ADP, and Challenger reports. On the technical side of things, we can see that the pair has retraced some of its gains. Although there is already a hidden bullish divergence that is hinting at a turn, profit taking could still take the pair back to the 1.3100 handle so I’m going to put a small position there. Since my first entry is aggressive, I’ll be adding a more conservative long at 1.3000… just in case. 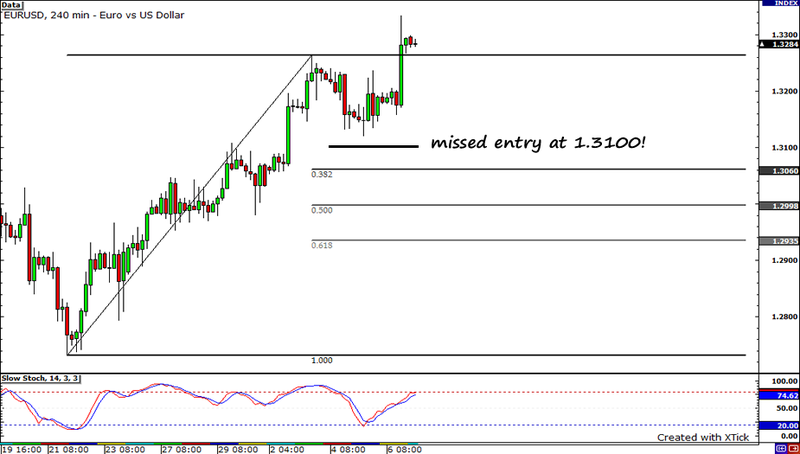 Both these positions will target former highs at 1.3250. To give my trade enough room to breathe, I will be putting a 150-pip stop, which is roughly equal to the pair’s average true range. My stop will also be below both the 38.2% and 50.0% Fibonacci retracement levels. My risk on both positions amount to 1.0%. 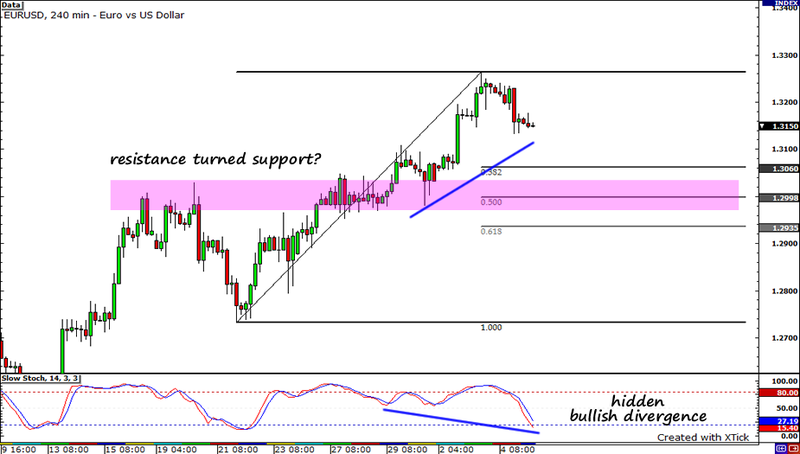 Long EURUSD at 1.3100 and 1.3000, pt at 1.3250, and stop loss at 1.2950. That’s my latest trade idea, dearies! You can also follow me on MeetPips.com!